A couple of days ago, a photo of reigning Miss Universe posted by facebook page "Asia's Next Top Model Cycle 5" with a caption that she's the newest host of the show. In the history of Asia's Next Top Model , Philippines placed runner ups except on the last season. The show was hosted by Philippines' supermodels Georgina Wilson, who hosted the third cycle of the show, and Joey Mead King who was a model mentor/co-judge of cycles 1-3. One thing that is true is that Pia will continue with her showbiz career when her reign is over! But as a requirement, the Philippine pride has yet to wait for her reign to be over before she can start working on her showbiz career, whether locally or internationally. Pia as a Miss Universe has passed the first step for a chance to enter a wider horizons! And of course, we believe that she also wants to continue doing charity work after her reign. ALSO READ : Pia Wurtzbach Joins "ASAP" in New York! 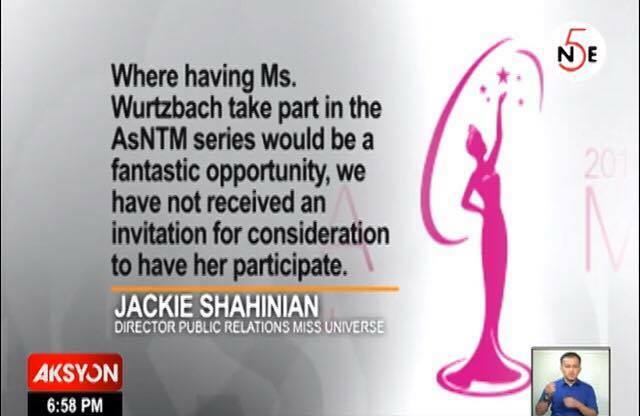 During her guestings in some talk shows, when asked about her future plans when her reign comes to an end, Wurtzbach candidly answered and revealed her Hollywood dream. "I might be the next Bond girl, who knows? So, well see, that's the next dream." Oh let's just hope she's in the next Bond movie. Fingers crossed!